With the GOP’s sweeping tax reform bill hurtling through the Senate, it’s been hard for ordinary Americans to know just what kind of effect its passage would have on them. Well, we can finally stop wondering, because it turns out that the bill is a resounding victory for the middle class: The GOP tax bill will require all eviction notices to come with an explanation of trickle-down economics! Looks like the Republican tax bill is shaping up to be a major victory for America’s middle class! As part of the Tax Cuts and Jobs Act, any eviction notice served to a tenant will now be legally required to include an explanation of how trickle-down economics creates jobs and growth by providing the richest Americans with additional wealth that eventually filters down to lower-income households. The new provision provides much-needed relief to beleaguered American families struggling to pay rent, as they’ll finally be able to understand that their misfortune is just economic growing pains before the 1 percent inevitably invests its extra cash into jobs and industry. 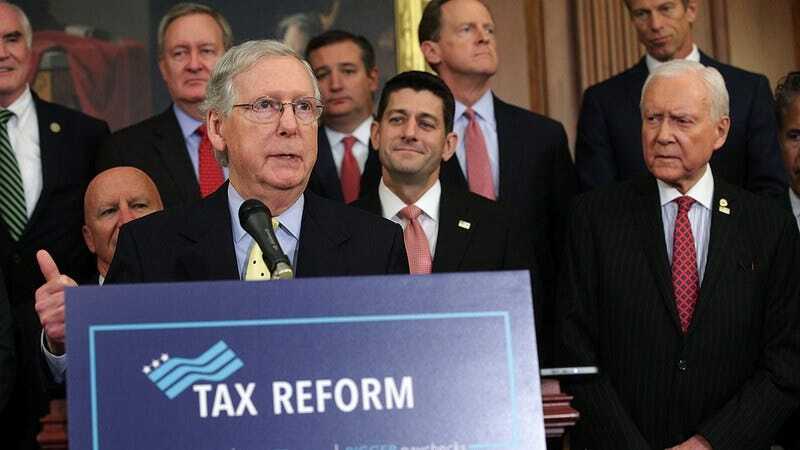 Critics of the bill have feared that it would decimate the middle class by raising taxes on low-income families, graduate students, and the self-employed, so the promise of a clear and simple breakdown of how giving tax cuts to the wealthy actually helps everyone on every eviction notice is definitely welcome news. While the full text of the bill has yet to be released, here’s what we do know. The regulation would go into effect on all eviction notices served after January 1, 2019, with the possibility for renewal in 2026. While the bill itself does not specify what language must be included on eviction notices, it requires that they provide all evicted tenants with the broad strokes of supply-side economics and legally mandates that the notices include the phrase “a rising tide lifts all boats.” Sources in Washington have also confirmed that the GOP tax plan requires that all eviction notices include a helpful diagram of a melting ice cream cone, to help the “trickle-down” metaphor make sense. Amazing! It’s really refreshing to finally see government working like it’s supposed to: helping out the people who need it most.